Do you remember the story? Jesus’ family had heard that so many were coming to hear Him that he could not even eat, so they decided to find him, seize him, and take Him home, for they thought, “He is beside himself.” Of course, Jesus’ mother and brothers thought they were doing the right thing, to save Jesus from Himself. And yet, when they approached the house in which he was teaching, Jesus rebuked them, asking, “Who are my mother and my brothers?” as if He were denying His own family. We can’t imagine any family would take that well. Many would turn around, return home and disown their errant family member! 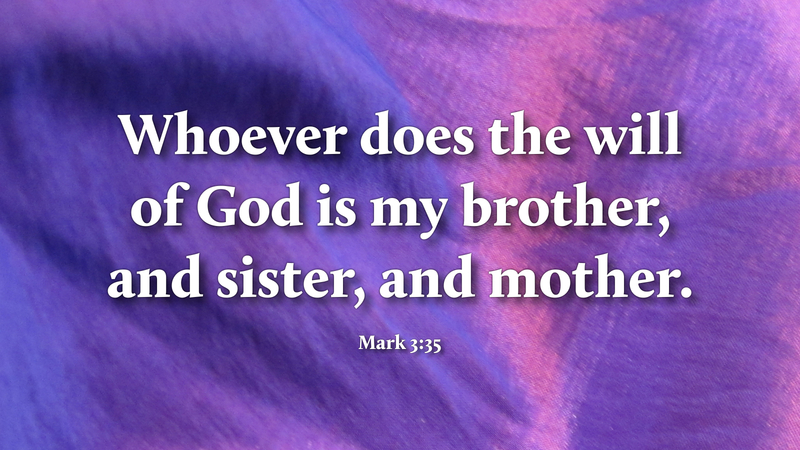 Interestingly, St. Mark tells us nothing about the response of Jesus’ family. What we do know, however, is that Mary didn’t give up on Jesus and, by the Book of Acts, His brother James was head of the Church in Jerusalem. It appears Jesus’ family members were not so easily offended. As persons who have been saved by Jesus Christ, by baptism into His death and resurrection, it is for us now to give our lives “doing the will of God.” Being redeemed doesn’t free us from the will of God, but frees us to do the will of God without thinking we have to save ourselves. Now, we do the will of God because we wish to, not because we are forced to. And that makes all the difference in how we live our lives! Prayer: Lord our God, because we have been saved by the death and resurrection of Jesus, give us grace to know and do your will; through the same Jesus Christ our Lord. Amen.